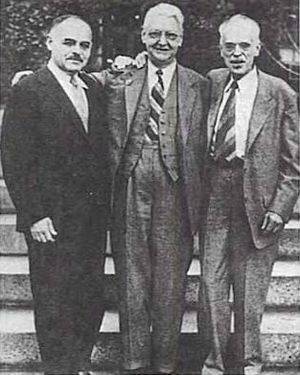 Louis Wolff, Sir John Parkinson and Paul Dudley White, who discovered the phenomenon that later would be called the WPW syndrome. The upstroke of the QRS-complex is 'slurred', resulting in a delta-wave (arrow). Conduction through the accessory pathway results in a delta wave. A atrioventricular tachycardia through the accessory bundle. 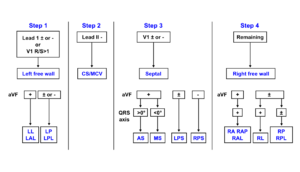 The electrical signal travels from the ventricles via the accessory bundle to the atria and returns to the ventricles via the AV node. In 1930 Louis Wolff, Sir John Parkinson and Paul Dudley White described 11 patients who suffered from bouts of tachcyardias. Their ECGs showed two abnormalities: a short PQ time and a delta-wave. Ever since one speaks of the Wolff-Parkinson-White syndrome in patients with complaints of syncope and / or tachycardia and a pre-exitation pattern on the ECG (WPW syndrome = WPW pattern + symptoms). Not all patients with a WPW pattern on the ECG are symptomatic. The prevalence of the WPW or pre-exitation pattern is relatively common in the general population (about 0.15-0.25%). 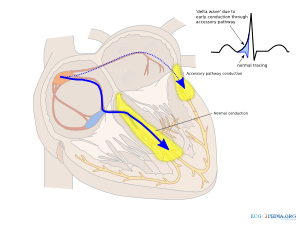 The pre-exitation pattern is caused by an extra connection between the atria and the ventricles (accessory bundle) that forms an electrical bypass to the AV node. The part of the ventricle where this accessory bundle connects are the first to depolarize. This is shown on the ECG as a delta wave. The QRS-complex is somewhat widened (> 0.10 sec). Also the PQ time is shorter (< 0.12 sec). 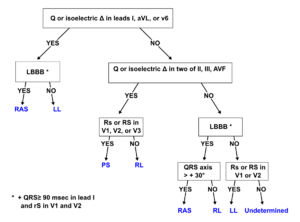 By observing the pattern of the delta wave in the different leads, one can estimate the location of the accessory bundle. An atrioventricular tachcyardia, in which the electrical signal from the ventricles is conducted back to the atria. These fast arrhythmias (> 200 bpm) can deteriorate into ventricular fibrillation and sudden death. A supraventricular tachycardia with 1:1 conduction through the accessory bundle. 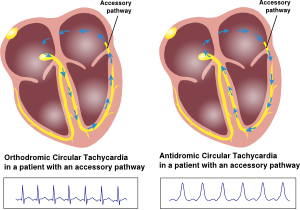 A typical example is atrial fibrillation. Atrial fibrillation in WPW can result in a fast and irregular tachycardia: Fast, Broad & Irregular (FBI). This fast arrhythmia also carries the risk to deteriorate into ventricular fibrillation and sudden death. In clinical practice it is therefore important to distinguish benign from malign accessory bundles. Sudden disappearing of the pre-exitation pattern during exercise testing. The occurence of very fast arrhythmias during spontanous attacks of atrial fibrillation (> 240 bpm). WPW can be treated by destroying the accessory bundle with ablation therapy. Depending on the type of arrhythmias that occur anti-arrhythmic therapy can play a role. By closely observing the shape of the delta wave on the ECG, the location of the accessory connection can often be estimated. Several algorithms have been developed for this purpose. 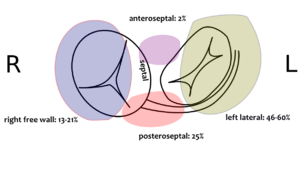 Seen from the apex, the tricuspid and mitral valve form a plane, relative to which the accessory connections are named. This page was last edited on 18 December 2012, at 17:15.